460 pages | 15 B/W Illus. The full text of The History of Mexico: From Pre-Conquest to Present traces the last 500 years of Mexican history, from the indigenous empires devastated by the Spanish conquest through the 21st-century, including the election of 2012. Written in a clear and accessible manner, the book offers a straightforward chronological survey of Mexican history from pre-colonial times to the present, and includes a glossary as well as numerous images and tables for comprehensive study. In addition, the companion website provides many valuable tools for students and instructors, including links to online resources and videos, discussion questions, and images and figures from the book. 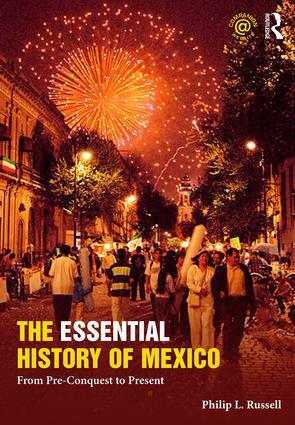 "This book fills an important need for Mexican history courses. It deftly balances content and scope to provide a thorough yet accessible treatment of Mexico’s history. Its attention to international context, social and economic developments, and its inclusion of primary documents make it eminently suited for the college classroom." "The Essential History of Mexico is a highly accessible yet comprehensive introduction to Mexico, from the earliest indigenous societies to the present day, through the Conquest, Independence, the Mexican Revolution, and beyond. It is a powerful resource for understanding Mexico's international relations, including Mexican immigration to the U.S., and for anyone engaged in global settings where the knowledge of Mexico is indispensible." "This comprehensive and thorough synthesis of Mexican history is tailor-made for a survey of Mexico course. From its clear prose to the fascinating primary sources it includes, this text will keep students both engaged and interested." Phillip Russell is an independent historian from Austin, Texas, and the author of Mexico under Salinas.